A Fever of the Blood by Oscar de Muriel is a Victorian-set mystery adventure about two mismatched Edinburgh police detectives investigating a murder that takes place in a mental hospital. The likely culprit, an aristocrat committed to the asylum in secret some years previously, has escaped and is on the run, and it's up to Frey and McGray to track him down. What follows is a rollercoaster ride of an investigation that uncovers all sorts of sinister secrets and drops Frey and McGray into various life-threatening situations. Frey and McGray are classic odd couple: Ian Frey is a fastidious, effete English gentleman with a scientific background while 'Nine-Nails' McGray is an eccentric, foul-tempered Scot obsessed with witchcraft and the supernatural. Neither man hides his dislike of the other, which fuels much of the comedy of the novel, but their particular interests are both essential to their solving of the mystery at the heart of A Fever of the Blood. This is the second outing for Frey and McGray, and I haven't read the first, although I think I would have liked to have to done so before I read A Fever of the Blood. Frey and McGray are both somewhat over-the-top characters in their own way and while this adds to the comic effect of the partnership, a more gradual introduction to them might have helped in order for me to find them more plausible. That said, I did become quite fond of them both by the end of the book. 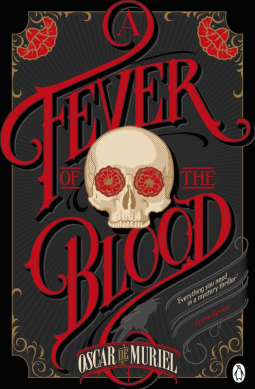 A Fever of the Blood is not a book to pick up if you're looking for gritty realism - it's a crazy Victorian adventure in which Frey and McGray are constantly plunged into desperate peril, and many of the characters, particularly the villains, are larger than life. The pace is fast and it's all very entertaining, plus it's very funny at times. However, I felt the period atmosphere was somewhat lacking - the language in Frey's narration and in some of the dialogue sometimes seemed jarringly modern, and I didn't get a strong sense of place from either of the book's main settings. I think this, and the fact that I hadn't read the previous book in the series to get to know the characters, was why I didn't find it quite as absorbing as I'd have liked. It was a fun, easy read, and there are many elements to this book that I enjoyed, but somehow it seemed less than the sum of its parts. My thanks to the publisher, who sent me a copy of this book to review via NetGalley.